Travel through time back to Woodstock 1969 and join Jimi Hendrix and the gang for this online slot, 5 reel online slots jam. 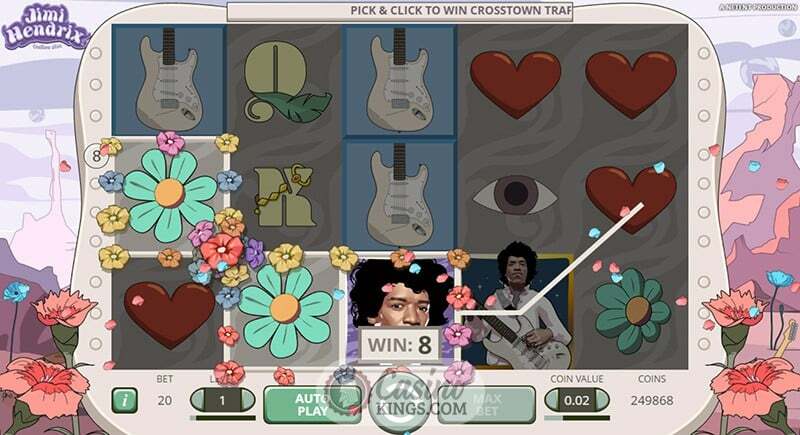 Soundtracked by some of Hendrix’ most well-known tunes, this rock n roll adventure will surely win you some groovy free spins and wholesome cash rewards. Leaving you prepared to rock your way to greatness in this electric online game from the NetEnt magicians. NetEnt is a Swedish company that was founded in 1996 and is one of the most successful online casino providers. In 2006, their casino module was voted as one of the top 20 modules, becoming one of the most popular online casinos in the world. They were one of the first to base their software of Java and then moved on to use HTML5, their slot games software is used in over 300 fully licensed portals. They have a popular live dealer platform and have utilised the touchscreen technology on our mobile devices for their highly successful mobile gambling platform, NetEnt Touch. 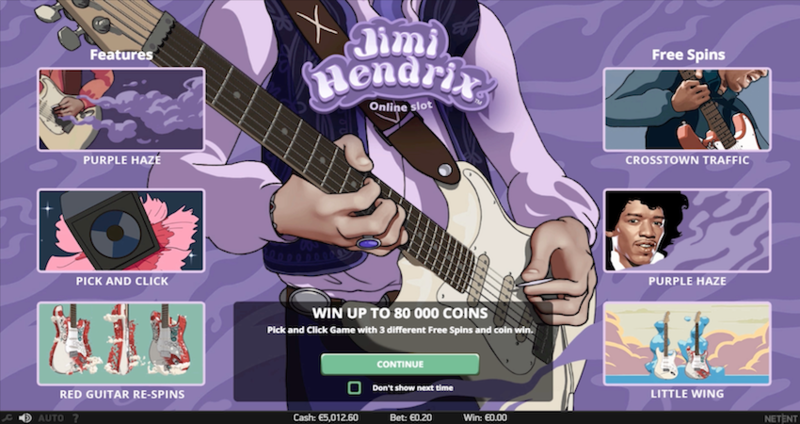 Immerse yourself in the music world with Jimi Hendrix online slot, one of three of NetEnt Rocks trilogy that incorporates music with player interaction. You can play along with the legend himself in this 5 reel, 20 fixed pay line slot game. You can strum with the master from 20p to £200 a spin, which means any player, from all budgets, can join in on the Woodstock experience. The game opens up with an intro featuring Hendrix playing his guitar, transporting your back in time to the flower-power era. In the background, you have a classic soundtrack with Crosstown Traffic, Little Wing and Purple Haze as you spin the reels. This rocking online slot game is packed full of bonus features. First up is the Red Guitar Re-spins feature. This is activated when you land 4 or more Red Guitar symbols anywhere on the reels, these will stay on the reels and act as overlay symbols during each re-spin. Continue to land more Red Guitars to keep re-spinning, the feature only finishes when no Red Guitars appear on the reels. Then you have the Purple Haze feature which is triggered when the Purple Haze symbol lands on the 1st reel. The classic card value symbols of 10, J, Q, K and A are transformed into Wild symbols for that spin. The Purple Haze is also the Wild symbol which will substitute other symbols for a greater winning potential. If 3 Scatter symbols appear on the 3rd, 4th and 5th reel you will activate the Pick and Click feature, click on one of the loudspeakers, there are 4 varieties of symbols and you need 3 of a kind to activate one of the 4 bonus features. The Crosstown Traffic Bonus gives you 6 Free Spins with Wild Reels. The Purple Haze Free Spin gives you between 6 and 12 Free Spins plus the Wild Purple Haze feature. The Coin Win feature will reward you with a multiplier between 8 and 30 times your total stake. Finally, you have the Little Wings Free Spins feature, this gives you between 6 and 12 Free Spins plus 3 to 5 random overlay Wilds will appear on the reels. 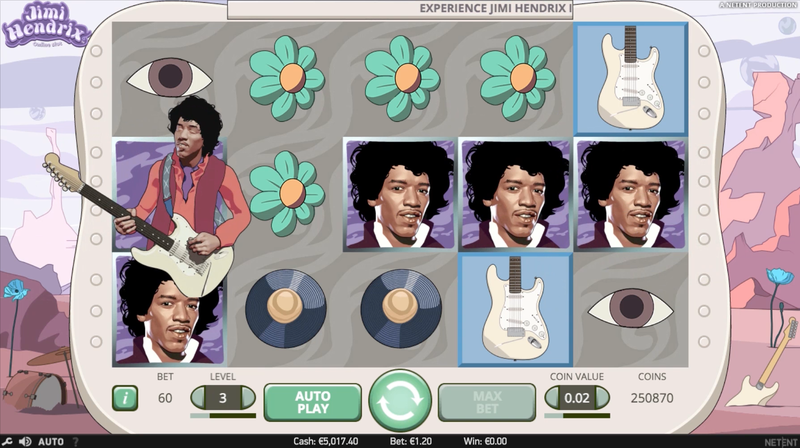 From its rocking theme, extensive bonus features, cash prizes and stunning visual graphics and animations, Jimi Hendrix online slot is going to be a legendary game just for its namesake. What’s truly brilliant is that the betting range will appeal to every type of player, so everyone is guaranteed to be blown away. If you enjoyed Jimi Hendrix Online slot then you are bound to also love Guns N Roses slots game or Click here to learn more slot games.